Er, apart from the dubstep-happy launch trailer. Remember when every trailer tried to invoke excitement through the use of dubstep? It was a dark period for promotional videos, and one that (otherwise gorgeous) Metroidvania forma.8 channels with its noisy launch trailer. 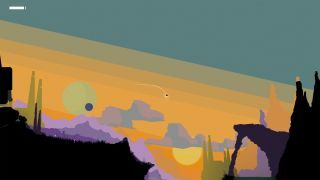 Despite that, this lovely-lookin' sidescrolling exploration game looks like something you might enjoy, providing you're a fan of Nifflas-style platformers, and other minimalist games that create a peaceful atmosphere through their use of colour, animation and sound design. You don't play as a person in this one; instead, you play as a probe, and as such you won't be waiting impatiently to get your double/high jump abilities, so you can leap to previously inaccessible areas. Nope, you can fly from the start here, as you investigate a stylish and mysterious alien planet. From everything I've read and seen, forma.8 reminds me heavily of the wonderful Knytt series, but with added combat and bosses, because some people want those, I guess. Look, I'll put the over-excitable launch trailer below—but stick around for a better one after that.